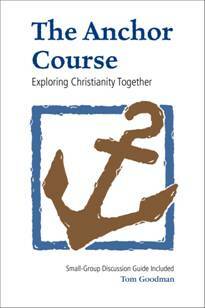 The Anchor Course is a 9-week small-group class designed for believers and seekers to explore Christianity together. If you are thinking about hosting the Course, this page will give you a chance to “test drive” one of the weeks yourself. The Anchor Course experience is made of four parts: some personal time, some social time, some study time, and some discussion time. Participants receive the textbook at the start of the Course. And on their own, before they come to class, they will read the section you�re planning to discuss in the next class. Weekly assignments are normally 3-4 chapters. Each week, the Anchor Course group will start off with some social time. Some Anchor Course groups share a meal each week together. Others just have snacks and drinks. Each week, the group will watch a 15-minute lesson on DVD. This is not meant to be a substitute for the reading, but it will get everyone’s mind focused on the topic your group will discuss together. I will provide outlines of the DVD talks to make it easier for participants to follow along. Download the following outline and print a two-sided document. Fold the document in half, and you will have the outline for the DVD talk. Note: You may be able to view the video without delay by clicking "Watch". If this doesn't work, you can "Download" the file to your hard disk and use the player of your choice to view the video. The weekly Anchor Course meetings conclude with a 45-60 minute discussion. On the back of the outline you downloaded, you will see discussion questions for Week Two, and a note about next week’s reading assignment. The questions will cover both the book readings and the DVD lesson. First, order the number of books you’ll need for the course at Lulu. The books cost $12.84 plus shipping. There is a discount for bulk orders. Second, I have a teaching DVD available for $25. You do not need the DVD to lead the Course since there is a discussion guide in the back of your book. However, the DVD can be a helpful resource. It includes nine 15-minute talks, the discussion guides, and your leader's guide. Contact me at TomIsAnchored@gmail.com or 512-497-5238. Third, set aside the best evening at your church for the Course one night a week for nine weeks. I’ve run my courses on Sunday morning during the small-group Bible study time, and also on Wednesday evenings since our church hosts a midweek meal on that night. I recommend you begin your Course every week with a meal or at least a social time around snacks. Fourth, promote the Course at your church. Don’t just depend on advertising, however. Make some personal invitations to seekers and new believers that you know. Also, I’ve found it useful to contact believers who do a good job at building relationships with seekers and encourage them to bring their seeking friends to the Course. Fifth, the first night of your nine-week Course is simply a “get acquainted night.” It’s a chance for prospective participants to meet you and learn about the course. At my church, we have what we call a “Get Anchored” Dinner on this first night, and I recommend this. Your copy of the DVD will have a “Get Anchored” talk that I provide for the first “get acquainted” night. Those who decide to enroll should be given their book on this first night, and they should be instructed to read Part One by the next week’s meeting.